A tribute to the birding community, which comprises of truly wonderful people, and of which I am a proud member. 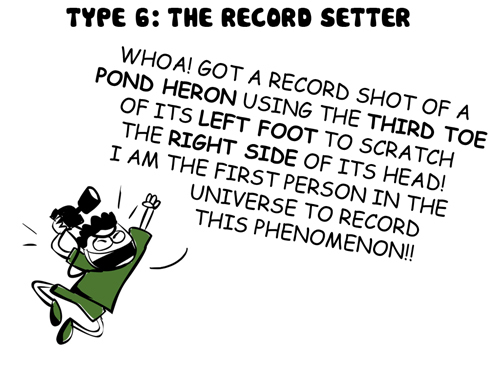 Birders are indeed an interesting bunch to hang out with (include me in that too!) 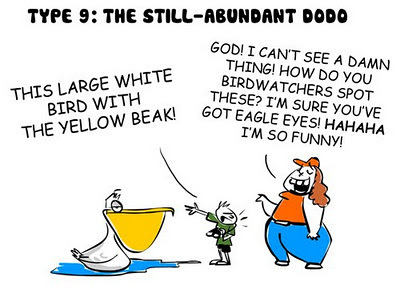 One outing with a bunch of binoculars-carrying avian aficionados and you'll know exactly what I'm talking about. I personally, have met (and even been) some of these types! The compilation is available as a poster. Send me an email to order your print or click here to buy the poster from my Redbubble store. This is awesome! I have been through most of those phases! 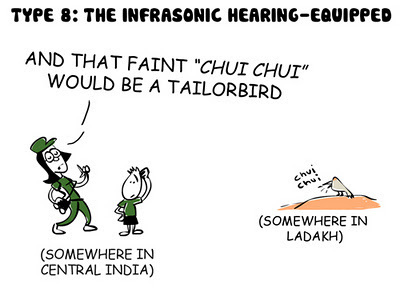 Awesome - each one, esp hearing the Chui Chui from central India of the bird in Ladakh :) Happy great year! Nice... I feel most of us are bits of each type listed here in different proportions! Every frame is a 'Class Apart', made with such dexterity. Its so touching...i believe most of us have passed thru this, directly-or-indirectly. Would like to have this compilation in print/poster form. Please reply back. those who want to order the prints, kindly send me your email id's on rohanchakcartoonist@gmail.com . i will get back to you with the details asap. you've earned yourself a follower! This is pure genius! 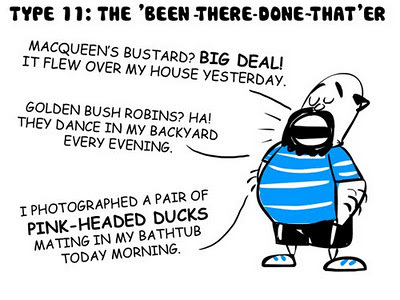 I can relate to all the types, but the exaggeration is just side-splittingly hilarious! Happy 2012 and keep up the great work! Thanks a lot Gowri! glad you could relate. Terrific! Just loved this post. Thanks for sharing it with all. This is amazing and outstanding work Rohan! Great stuff and really compliment the funny bone and the creative artist in you!! Brilliant...i bet you are the premier nature-related cartoonist in the country now. Keep it going. I like the "Rocket-tailed" the most, heard that one last week! Thanks a lot Preethi and Mohanram! 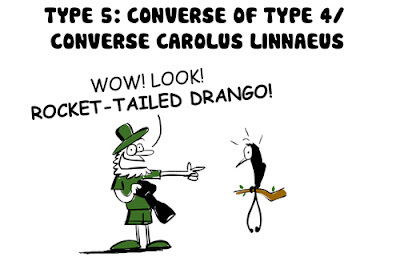 Hahahaha I know where the Racket-tailed Drango comes from! Good work Rohan..... 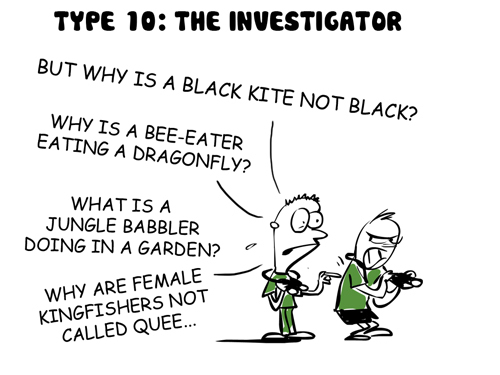 If I ever get into serious birding or go out with serious birders, I resort to the type 10. 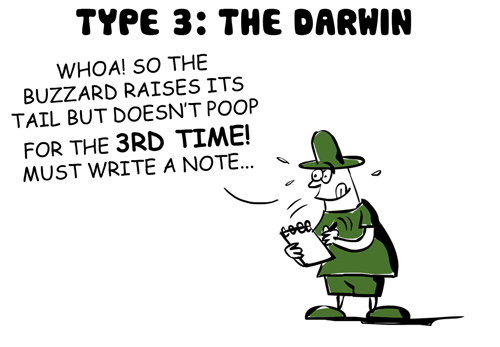 Its fun to harrow the type 3,4 and 8 types of birders by being a type 10. Wonderful - couldn't stop laughing! Thank you Silvia. 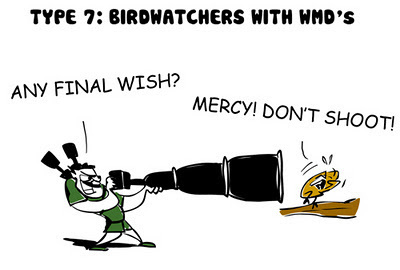 This was a parody on the birdwatchers you usually see in India. I don't know if people from other countries can relate to this..
hi! loved your cartoons.. you are one of those few people i have come across who takes their two completely different and unrelated interests and make something really special out of it.. u must be really passionate and witty.. keep them coming!! 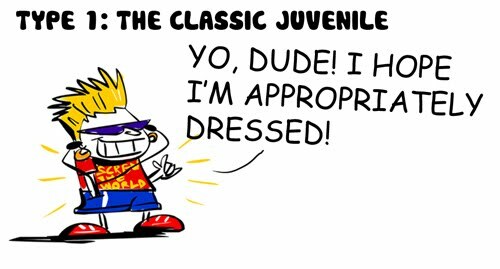 Thank you 'comics junkie'! You are very generous :) Stay tuned, there's a lot more coming up. 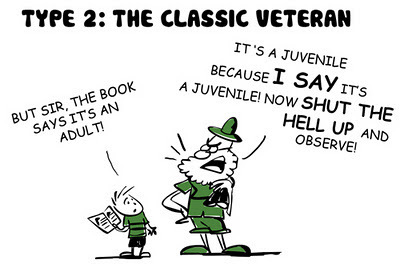 ROFL, Rohan, "Rocket-tailed Drango" brought back memories... lol! 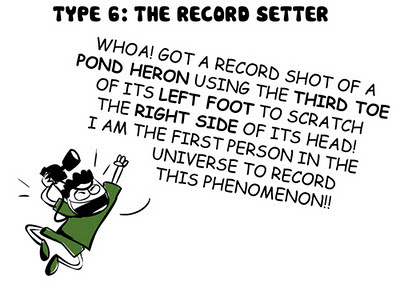 "The lens gazer": This is the birder who never actually spots the bird with their naked eye. They move from binoculars to camera with such focus (pun intended) that they manage to spot, photograph and ID the bird from the picture, but all without actually seeing unframed by a lens. "The skeptic": They are always the last to believe that there was actually a bird to see, and then when they have no choice but to admit it, they argue about which one it is. 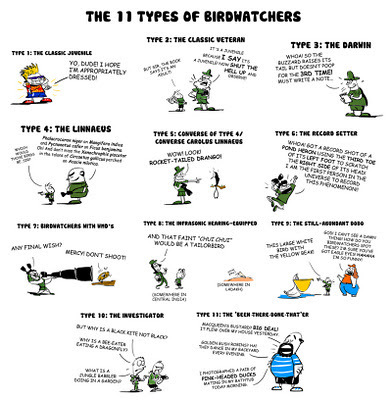 I'm probably Type 5 and can think of many birders falling in other categories. Enjoyed these cartoons. Will be looking at more done by you. Seeing these again today for a refresher and also sharing them on Indian Birds FB group. 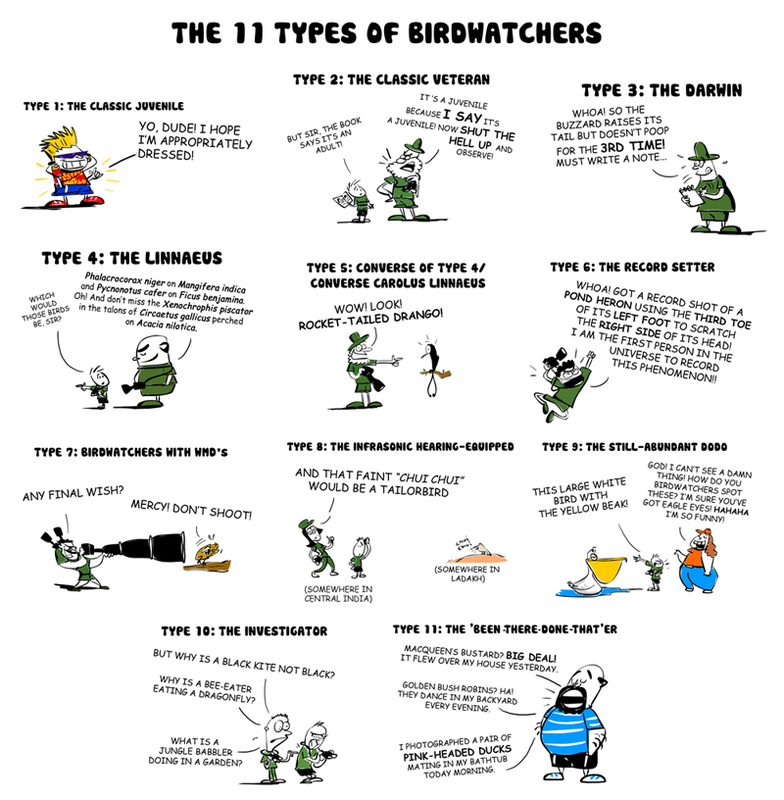 Haha.....very amusing....but how come ...there isn't a category on twitchers?? Superb, leading birdwatching groups and birding over 3 decades in different cities and countries is a nice experience which you have summarized in these wonderful cartoons. I would say they are all the same types in almost all the places I have been. Though my compliments is rather late in the day....I must congratulate you for having an astute understanding of this peculiar breed of homo sapiens called bird-watchers. 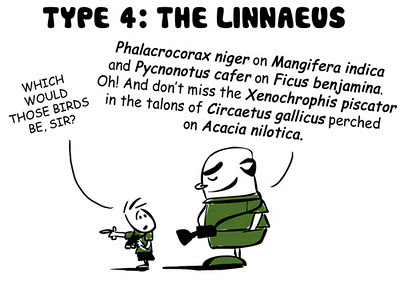 I have had personal experiences of meeting your 11 types and was shocked to realise that I could easily be 'classified' as "THE LINNAEUS", thanks to a masters degree in Zoology and being a Biology Teacher.I felt elated and humbled by your caricatures. Your caricatures are shockingly close to the truth and helped me poke fun at myself. Whenever us 'bird-watchers' come together, our favourite past-time, other than talking about birds is to try and 'classify' each other according to your absolutely accurate 'system of classification' with hilarious effects. 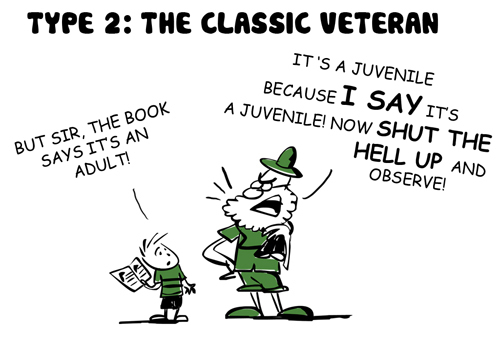 I must add a caveat that not every bird-watcher will accept the classification, especially "THE CLASSIC VETERAN" type. Thank you for everything Rohan. The details in each jest is simple and apt - had a good laugh! Hw true are these. It has subtly explains different class of birders. Excellent humour. I need poster of it. Hilarious. Only a birder can describe these types. Rohan - i need a poster of it.. pls let me know wht do i need to get one :) ? Thanks a lot everyone :) Dilbarmano, you can send me an email on rohanchakcartoonist@gmail.com mentioning your complete postal address and the number of prints you want. Nice one! p sI'm a juvenile, but i don't dress and talk like that :P I'm type 10 i guess? Great and thanks for this eye opener humor. Hilarious, esp. 3,5,6, and 8! Rocket-tailed drango is a real gem! Awesome compilation! Just loved it.